A smartphone app to test eyesight is as good as the traditional chart, according to a new study. Peek (the Portable Eye Examination Kit) is a smartphone-based system for comprehensive eye testing anywhere in the world. It was designed and developed by the London School of Hygiene & Tropical Medicine, the University of Strathclyde and the NHS Glasgow Centre for Ophthalmic Research. The research, published in JAMA Ophthalmology, shows that the results from the app tests carried out on 233 people in their own homes and repeated in eye clinics based in Kenya were as reliable as those from standard paper-based charts and illuminated vision boxes in an eye clinic. The average difference was the equivalent of less than one line in an eye chart. Researchers emphasized that the app test is designed not to be dependent on knowledge of the symbols or letters used in English. Globally, 285 million people are visually impaired and 80% have diseases which could be cured or prevented, according to a news release. However, most live in low-income countries and remain in the dark because of limited access to specialist clinics. 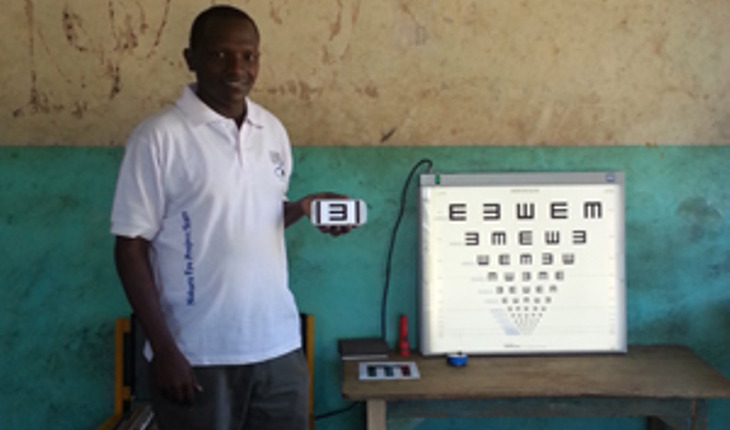 Peek offers a solution by enabling health workers to test eyes easily and affordably in the community. Lead author Dr Andrew Bastawrous, Lecturer in International Eye Health at the London School of Hygiene & Tropical Medicine and co-founder of Peek, said, “With most of the world’s blind people living in low-income countries, it is vital we develop new tools to increase early detection and appropriate referral for treatment. Mobile phone use is now so widespread that it seemed to be an ideal platform. The researchers, who have tested Kenyans 55 and older, are now going to analyze the effectiveness of Peek in teachers and schoolchildren.